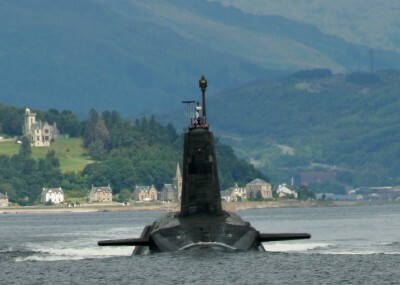 The most likely scenario in which Trident would actually be used is that Britain would give legitimacy to a US nuclear strike by participating in it – and so guarantee the UK’s retaliatory annihalation. With thousands of marchers expected to converge on London on Saturdayto protest against government plans to renew the UK’s nuclear weapons of mass destruction, it is worth asking once again: what is Trident for? Why does Britain feel any need at all to be in possession of nuclear weapons with many hundreds of times the destructive power of the Hiroshima and Nagasaki bombs? Atomic explosion transfixed over a sunset in the Dominican Republic. Artwork: _Gavroche_ via Flickr (CC BY). The UK’s deterrent is an important part of the deterent structure of NATO, of our alliance with the UK, and helps the United Kingdom to continue to play that outsized role on the global stage that it does because of its moral standing and its historical standing. “It’s important to have a military power that matches that standing”, he continued in masterpiece of Orwellian doublespeak, “and so we’re very supportive of it. And of course we work with the United Kingdom, we are intertwined on this program, mutually dependent. We are partners in this very strongly. He then added that Trident was “part of the special relationship” of the UK and the US – in effect threatening that without Trident, that special relationship would be weakened. The first thing is that such an intervention in what should be a purely internal UK debate is most unusual. It indicates deep concern about the ‘Trident review’ under way in the Labour Party, and about the impressive performance of Labour’s Trident-sceptic shadow defence secretary Emily Thornberry. So exactly why is it so important to the US? Of course there is the financial aspect of the matter. The cost of the missile system with warheads is likely to come out in the region of £5-10 billion. US contractors are also likely to do well out of the submarine contracts, since the new nuclear reactors are to be built to a US design. Less than a year ago, in April 2015, the BBC was reporting a total Trident system cost of £17.5 – £23.4 billion, most of which, £12.9 – £16.4 billion, would go on the four nuclear submarines. But now the subs are costed at £31 billion, with a £10 billion contingency. The cost of the subs, in other words, almost trebled in less than a year. But of course that’s just the beginning: the system also has to be staffed, fuelled, protected, maintained and so on. Last October Reuters reported that the total life-cycle cost of a new Trident would actually be £167 billion, of which £25 billion would go on the submarines. But even that eye-watering figure is already out of date, based on the latest submarine costs which are £6 billion higher – and that’s ignoring the £10 billion contingency. So what’s it really going to cost? Take a high guess, and double it. Call it £300 billion and you might not be far off. As much as a third of that could reasonably end up with US contractors. Adding legitimacy to a US nuclear attack? In practice, the only way that Britain is ever likely to use Trident is to give legitimacy to a US nuclear attack by participating in it. There are precedents for the USA using UK participation in this way for conventional military operations. The principal value of the UK’s participation in the recent Iraq war was to help legitimise the US attack. Likewise the principal value of the firing of UK cruise missiles as part of the larger US cruise missile attack on Baghdad was to help legitimise the use of such weapons against urban targets. The most likely scenario in which Trident would actually be used is that Britain would give legitimacy to a US nuclear strike by participating in it. This scenario is all too credible – and raises the important idea that far from the UK’s ‘independent deterrent’ being there to deter attack from our enemies, that its real purpose – certainly as far as the US is concerned, is make it easier for the US to launch a nuclear attack. The UK’s possession of a Trident nuclear missile system, therefore, makes nuclear war more likely rather than less. Its use would also, if deployed against another sophisticated nuclear-armed state such as Russia, guarantee the UK’s retaliatory annihalation. Nor can we rule out the possibility that the UK might be lured into firing off its missiles alone, whether by diplomatic trickery or technical subversion, giving the US a ‘hands off’ first strike capability that would leave it untouched, and the UK wiped out. The UK Trident system is highly dependent, and for some purposes completely dependent, on the larger US system. The assembling of information available in the USA, but kept secret in Britain, by John Ainslie in his 2005 report The Future of the British bomb, shows how extensive this dependency is. The UK’s dependency on the USA has operational significance. For example, the UK’s reliance on US weather data and on navigational data provided by the US Global Positioning System (GPS) means that, should the USA decide not to supply this data, the capacity of the UK’s Trident missiles to hit targets would be degraded. In fact it could get worse than that. If the GPS system was not merely closed off, but was used to send wrong data, then the missiles could be diverted to land harmlessly in the ocean, or even to strike other targets. Video: Trailer for ‘The Megaton Nuclear Bomb: A Guide to Armageddon‘ by Concord Media. And who is it meant to deter, anyway? So what exactly is the UK’s “outsized role on the global stage”? This is a clear reference to the UK’s military attacks on other countries, invariably in support of US campaigns. Think Iraq, Afghanistan, Libya, Syria. The US values the UK’s military support for the ‘legitimacy’ that it provides and the sense that the US forms part of an ‘alliance’ and is not acting unilaterally. And the role of Trident is clear: to allow us, while engaging in further military attacks on other sovereign nations, to deter retaliation by threatening a nuclear strike in response. This has nothing to do with defending the UK against some ‘mad dog’ dictator irrationally determined to destroy us. It is all about providing cover for our own military adventurism and that of the US. So there we have it. Trident will do little or nothing to defend our Sceptered Isle in time of national threat, unless the US allows us to use it. It is a weapon of attack, intended to provide cover for the UK’s military aggression overseas. But above all it is there to lower the threshold for US nuclear attacks on other countries, perhaps even giving it a ‘hands off first strike’ capability – in the process condemning Britain to national extinction. And what’s more, doing it all at UK taxpayers’ expense.